PRESENT A UNIQUE GIFT THAT LEAVES A MEMORABLE IMPRESSION: This beautiful Oh! 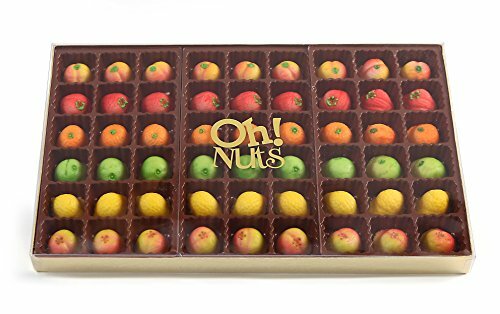 Nuts extra-large tray features an astonishing collection of 54 delectable marzipan miniature fruit-shaped treats. The gift box is neatly divided into 54 small compartments to highlight the beauty of each individual piece. INCREDIBLY LUSCIOUS RICH TASTE: You and your family will enjoy the unique flavors of these festive marzipan snacks. These visually stunning candies are artistically crafted to resemble an array of beautiful fruits including peaches, oranges, lemons, green apples, nectarines and strawberries. SERVE UP SOME HOLIDAY TRADITION: Marzipan treats have long been part of the Holiday traditions for families around the world. Whether you originally hail from Norway, America, or Guatemala, shaping almond paste into delicious candies is a cherished part of the holiday season. Replace boring candy baskets, baked goods and chocolates with these trendier dessert treats. SAY THANK YOU WITH THESE YUMMY SNACKS: Whether you are looking to show appreciation to your grandfather or grandmother, to your hostess or coworkers, him or her, the Oh! Nuts deluxe baskets bring joy and fun to every party. These marzipans are OK Certified Kosher, and non-Dairy. 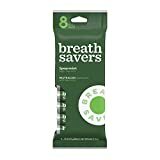 Pull them out when guests come over during the holidays or along with nuts after dessert during the long post-meal lingering period. ADD VALUE TO YOUR GIFTING THIS SEASON: Whether it's Halloween, New Year's, Hanukkah, an anniversary or birthday celebration, or a corporate lunch with clients, the Oh! Nuts signature marzipan arrangement is enjoyed by foodies and non-foodies alike. Presented in a BEAUTIFULLY WRAPPED DISPLAY BOX, it is all set to be sent and readily devoured. 100% satisfaction guaranteed; love it or get your money back.